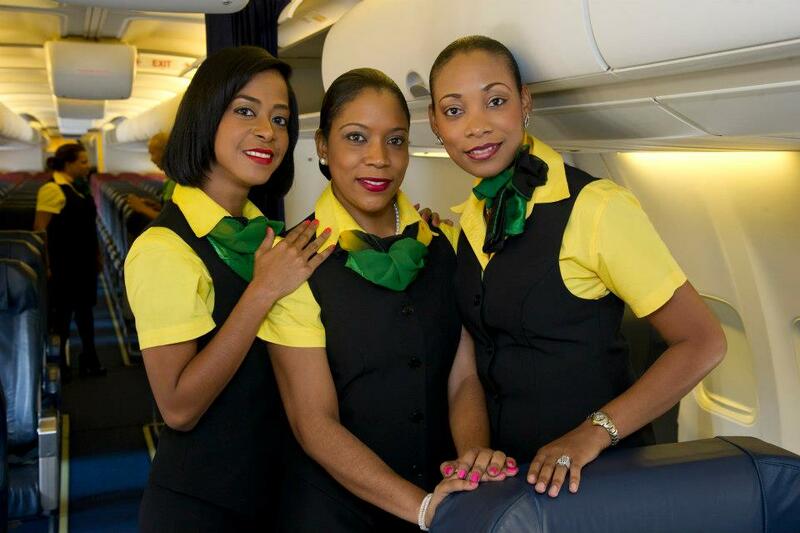 Fly Jamaica Airways as of today, March 31, has laid off all of its employees. The cash-strapped airline has been unable to resume operations since its only Boeing 757-200 (N524AT) crash landed at Guyana’s Cheddi Jagan International Airport on November 9, 2018. Top Copyright Photo: Fly Jamaica Boeing 757-23N N524AT (msn 30233) YYZ (TMK Photography). Image: 922818. This entry was posted in Fly Jamaica and tagged Boeing 757-23N, Fly Jamaica Airways, msn 30233, N524AT on March 31, 2019 by Bruce Drum. Fly Jamaica flight OJ256 from Georgetown, Guyana to Toronto this morning returned to Georgetown due to a “technical problem”. Ex-ATA Airlines Boeing 757-23N N524AT (msn 30233) was being operated by Fly Jamaica on the flight. The crew declared an emergency. On landing at Georgetown Cheddi Jagan International Airport, N524AT suffered significant damage. According to the airport, the flight was carrying 120 passengers and eight crew members. Six people were injured and are being treated at Diamond Hospital. Injures are not life threatening. Photo: Cheddi Jagan International Airport. Top Copyright Photo: Fly Jamaica Boeing 757-23N N524AT (msn 30233) JFK (Fred Freketic). Image: 944269. This entry was posted in Fly Jamaica and tagged Airplane Crash, Boeing 757-23N, Crash, flight OJ256, Fly Jamaica, msn 30233, N524AT on November 9, 2018 by Bruce Drum. Fly Jamaica Airways (Kingston) will launch a new route to Toronto (Pearson) on October 8. 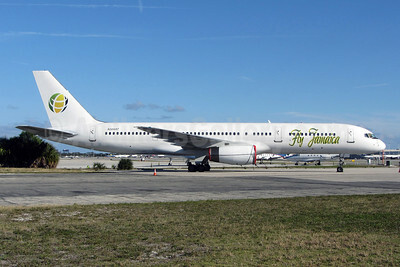 The new airline commenced scheduled services on February 14, 2013 between Kingston, Jamaica and New York (JFK) with this former ATA Airlines Boeing 757-23N N524AT (msn 30233). This entry was posted in Fly Jamaica and tagged 30233, 757, 757-200, 757-23N, aviation, Boeing, Boeing 757, Boeing 757-200, FLL, Fly Jamaica, Fly Jamaica Airways, Fort Lauderdale/Hollywood, kingston jamaica, N524AT, transportation on September 27, 2013 by Bruce Drum. Fly Jamaica Airways (Kingston) has been cleared by the Guyana government to operate scheduled passenger service from Georgetown, Guyana to both New York (JFK) and Toronto (Pearson). The airline is looking for a second Boeing 757-200 to operate the new routes. There is a long list of carriers that have tried to make the Georgetown-New York route viable. Fly Jamaica Airways began with a dream to create a truly regional airline, using local talent and with an emphasis on providing a truly local experience to its customers. An full-service, local airline that would bring the Diaspora, and the world, home to the Caribbean. Fly Jamaica Airways is a partnership between Chief Executive Officer and Guyanese-born Captain Paul Ronald Reece, and Jamaican shareholders, including Chief Operating Officer, Captain Lloyd Tai and Manager of In-Flight Services, Christine Steele. The Company was incorporated in Kingston, Jamaica on September 7, 2011 and started with a Boeing 757 aircraft. We faced a rigorous start-up process, including meeting national and international requirements. Through the stewardship of our experienced management and dedication of our amazing employees, we proved to aviation regulators that we have what it takes to be a world-class airline. On August 24, 2012, Fly Jamaica Airways conducted its demonstration flight from Kingston, Jamaica to Georgetown, Guyana, as part of the Jamaica Civil Aviation Authority’s (JCAA) approval process. On August 31, 2012 the JCAA issued our Air Operators Certificate (AOC). Fly Jamaica Airways has also satisfied rigorous requirements for the US Federal Aviation Administration (FAA), Department of Transportation (DOT), and Transportation and Security Administration (TSA), in order to operate as a commercial US-registered carrier. Top Copyright Photo: Brian McDonough/AirlinersGallery.com. N524AT rests at Fort lauderdale-Hollywood International Airport before going into revenue service. All other photos by Fly Jamaica. This entry was posted in Fly Jamaica and tagged 30233, 757, 757200, 75723N, Air Guyana, Boeing, Boeing 757, Boeing 757-200, Boeing 757200, civil aviation authority, federal aviation administration, FLL, Fly Jamaica, Fort Lauderdale/Hollywood, georgetown new york, N524AT, new york jfk on June 8, 2013 by Bruce Drum. Fly Jamaica (Kingston) ferried this Boeing 757-200 to Jamaica on March 17 from Fort Lauderdale/Hollywood according to this report by The Gleaner. The new carrier is now undergoing the document and demonstration evaluation phase with the Jamaica Civil Aviation Authority (JCAA) prior to receiving its Air Operators Certificate (AOC). The new airline has proved it is majority owned by Jamaicans. The upstart plans to fly to Georgetown, Guyana, New York (JFK) and Toronto (Pearson). The company will also need FAA approvals. This entry was posted in Fly Jamaica and tagged Fly Jamaica on March 21, 2012 by Bruce Drum. Fly Jamaica (Air Guyana) Boeing 757-23N N524AT (msn 30233) FLL (Mark Lawrence – Amateur Aviation Photography), originally uploaded by Airliners Gallery. Fly Jamaica (Kingston) is still waiting for authority to operate this Boeing 757 by the Jamaica Civil Aviation Authority (JCAA). The new airline was expected to commence operations on December 1, 2011 but this remains in limbo as the government considers its application according to this article by The Gleamer. The paper airline is proposing to fly (operated by Air Guyana) this Boeing 757-200 on a Georgetown (Guyana)-Kingston (Jamaica)-New York route and also from Kingston to Toronto (Pearson). Copyright Photo: Mark Lawrence. Please click on the photo for additional information. This entry was posted in Air Guyana, Fly Jamaica and tagged Air Guyana, Fly Jamaica on January 26, 2012 by Bruce Drum. 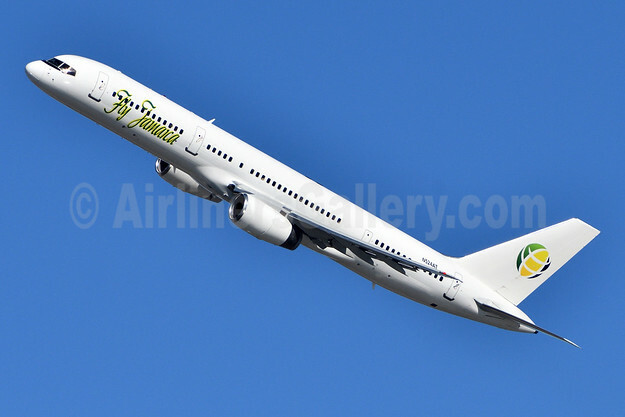 Air Guyana (Georgetown) is planning to operate this former ATA Airlines Boeing 757-23N N524AT (msn 30233) for newcomer Fly Jamaica (Kingston). 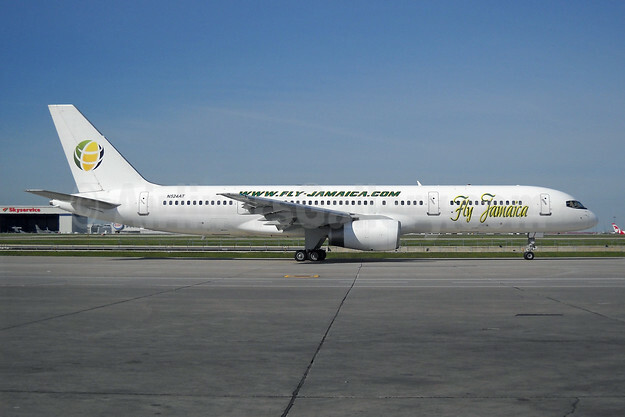 Fly Jamaica is planning to offer flights to New York and Toronto as well as connect back to Georgetown, Guyana. Wings Aviation Limited (Georgetown) is the parent company of Air Guyana Inc. Wings Aviation was established on February 1, 1984 as a result of the demand by the local mining sector for reliable and economical air transport service to the Interior of Guyana. Initially, Wings Aviation Ltd. provided charter services to the mining and indigenous communities in various interior locations utilizing, in the initial stages, a Cessna 185F, a Cessna 182, a Cessna 402B, and a Cessna TU206G. In November 1985, the company acquired a Mitsubishi MU-2 turbo-prop, which complemented its Cessna 402B charter service to the Caribbean and South America, and extended the Caribbean charter service to the Turks and Caicos Islands, the Bahamas and North America. In November 1993, Wings Aviation Ltd. became an ICAO approved aircraft-operating agency in the State of Guyana. On January 20, 1999, Wings Aviation Ltd. registered the trade name “Air Guyana”. On November 21, 2003 Air Guyana received its new AOC (Air Operator Certificate) from the Guyana Government. Air Guyana was incorporated on September 1, 2009, and has since been operating a Cessna 206G and a Cessna 208 B to the interior of Guyana and adjacent countries. This Boeing 757 is the first jet aircraft for the company. Copyright Photo: Mark Lawrence/Amateur Aviation Photography. N524AT is pictured on the ramp at Fort Lauderdale/Hollywood International Airport. Please click on the photo for additional information. This entry was posted in Air Guyana, Fly Jamaica and tagged Air Guyana, Fly Jamaica on January 8, 2012 by Bruce Drum.